The Staff Awards program at WestEd recognizes the accomplishments and excellence of our employees, both as individuals and as teams based in single offices or spanning locations nationwide. This award celebrates the many ways staff have a positive effect on our collaborative agency work. Adam Keim has worked to improve processes and develop “creative solutions to sometimes thorny and complex tasks and issues.” He goes above and beyond to help implement new workplace tools. 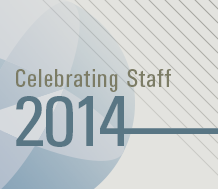 This award recognizes staff excellence in research, development, and service. With a respected track record of “hard work, responsiveness, integrity, insight, and great colleagueship,” Paul Koehler has had a huge impact on the field of education. He is the agency’s “go-to” person for assistance related to education policy work. As Director of the West Comprehensive Center, Koehler has become a trusted advisor to Chief State School Officers in Colorado, Nevada, New Mexico, Utah, and Arizona. He helped implement the innovative Mayors Education Roundtable programs in California and Arizona, and the U.S. Department of Education has sought him out to organize national and regional meetings. Rose Owens-West has a long history of successful collaborations with school districts. As one colleague stated, “She rolls up her sleeves and works with the most challenging administrations to get better outcomes for traditionally underserved students.” Owens-West has earned a national reputation in the field of equity providers, as evidenced by her recent invitation to participate in planning for the First Lady’s Reach Higher initiative. Kristin Reedy’s passionate involvement in promoting effective special education services began over 30 years ago as a direct service provider for children with autism and developmental disabilities. The cumulative excellence of Reedy’s lifelong work helped WestEd being awarded the National Center for Systemic Improvement, which Reedy co-directs. Through the breadth and depth of her work, Reedy has helped solidify WestEd’s reputation in the field of special education. Spycher has collaborated with California State University and the California Department of Education to develop California’s English Language Development (ELD) Standards and the California English Language Arts (ELA)/ELD Curriculum Framework—both of which are “helping redefine and improve education for students throughout California and beyond. Spycher has helped create a new view of education for English language learner students that raises the bar in the classroom” and has helped WestEd become a leader in supporting the needs of this group of students. By collecting, matching, and analyzing data on California’s students in foster care, this team filled a long-standing gap in knowledge about the academic achievement of this group of students. The team’s work culminated in the groundbreaking, first-of-its-kind analysis, The Invisible Achievement Gap: Education Outcomes of Students in Foster Care in California’s Public Schools. This team’s pioneering work has enhanced WestEd’s commitment to equity by raising significant awareness of how to better support the unique education needs of students in foster care. The Local Control Funding Formula (LCFF) is the largest overhaul of California’s K-12 education funding system since the late 1970s—and WestEd’s LCFF team has been playing a critical role, collaborating with senior state leaders and district administrators to develop regulations, guidance, templates, and structures to enable effective implementation of this law. The team created a website that serves as the primary LCFF resource and that has become a model for the California Department of Education to engage the field and public. The team’s work represents a major contribution to WestEd’s reputation in education finance.